It’s too late to jump into the workshops at this year’s Blues in the Gorge, but that doesn’t mean that you have to miss out on the magic of the four staff instructors — Mary Flower, Guy Davis, Orville Johnson, and Valerie Turner — all sensational and renowned masters on the acoustic guitar at the annual Acoustic Blues Masters Concert. The Menucha Retreat & Conference Center will host this year’s concert and workshops, and The Cascade Blues Association is cosponsoring the event, which is open to the public. For convenience, this year’s concert will be held in Corbett, which allows everyone to remain at the retreat rather then come into Portland for the performance. It will take place on Sunday, October 1 at 7:00 pm at the Corbett Grange Hall (Columbia Grange #267), 37493 NE Grange Hall Rd. Tickets are $15.00 in advance through the Menucha.org website or $20.00 at door. 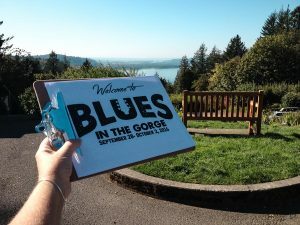 Blues in the Gorge participants are free.